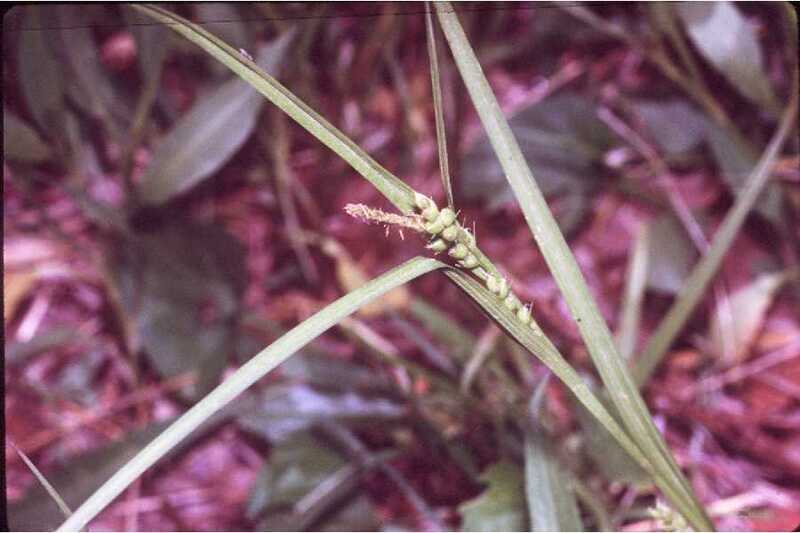 Carex granularis.Robert H. Mohlenbrock @ USDA-NRCS PLANTS Database.USDA SCS. 1989. Midwest wetland flora.Field office illustrated guide to plant species. Midwest National Technical Center, Lincoln (Accessed 4/2014). Carex granularis is a perennial sedge, 30-80 cm tall, stems clumped. Leaves alternate, blades 0.4-1cm wide, often longer than flowering stem. Flowers: male spike at top of stem, stalkless, female spikes 1-3 cm, cylindrical, dense, the lowest ones long-stalked, the upper ones contiguous with the male flower spike, perigynia crowded, 0.2-0.4 cm long, beak very short, straight, scales often shorter than perigynia, achenes top-shaped, 3-sided; inflorescence often waxy pale-green, bracts longer than stem. Habitat: Wet meadows, soil pH 6-7.2, tolerant of shade, fire and anaerobic soil, intolerant of salt, and drought (USDA, NRCS 2010).